Ever wondered how to draw your own comic book characters? Or how about drawing fan art of your favorite characters from all those great Japanese manga? Ever have difficulties trying to even draw something from your pencil onto that empty piece of paper? 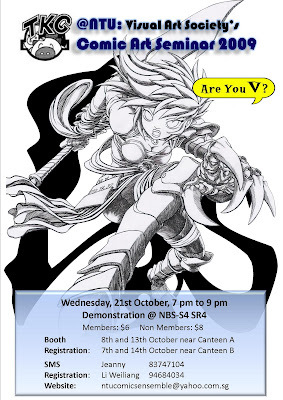 Comics Ensemble from VAS will be organizing a new Comic Art Seminar (formerly the Manga Illustration Workshop) for all fellow comics and manga enthusiasts. The workshop is perfect for all newcomers, and is also a great drawing session for familiar manga artists. Date of this workshop will be on: 21st October 2009. Do look at this poster for more details!